French artist Pierre Brassau, was an unknown talent, until he erupted onto the art scene in an exhibition in 1964. 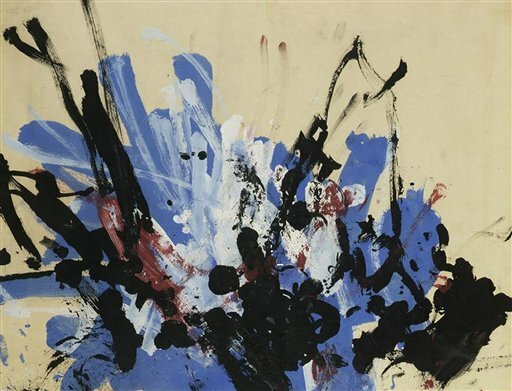 He was highly praised by critics and journalists as they admired the abstract art, with one even noting: “Brassau paints with powerful strokes, but also with clear determination. His brush strokes twist with furious fastidiousness. Pierre is an artist who performs with the delicacy of a ballet dancer.” All the while, another journalist, known as Dacke, giggled in the background. Brassau was actually a chimpanzee from a Swedish Zoo and Dacke had constructed a ploy to test and trick the critics. 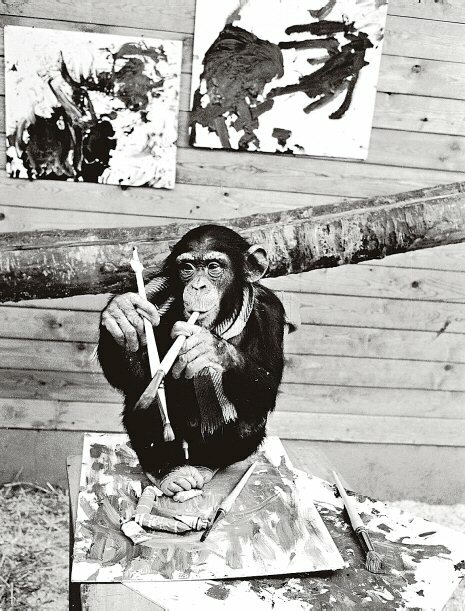 The chimp had painted a collection of pieces, which apparently heavily featured cobalt blue, as he liked the taste and only one person had declared as a joke that the art must be the work of an ape! And as for the journalist who had praised the work, he stuck by his view and Chimp Brassau went on to sell his work. Pennywell Farm in Devon is populated by aww-inducing miniature pigs, their cuteness isn’t all they’ve got going for them though as they’ve been nicknamed as little Pig-assos. 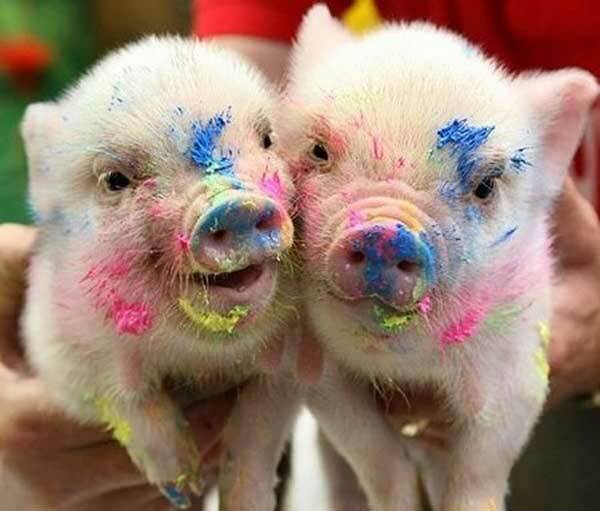 It all happened by accident as one day the rascals escaped at a craft-fair and started exploring the pots of paint, creating masterpieces as they went. Now the ‘Trotters Independent Painters’ sell their modern art for up to £16 to raise money for the Farm Crisis Network Charity. They cover their snouts and trotters in paint and work their magic, with farm owner Chris Murray comparing their “messy” work to Jackson Pollock. He told the Daily Mail: “The pigs tended to go more for pointillism – they weren’t too keen on cubism”. 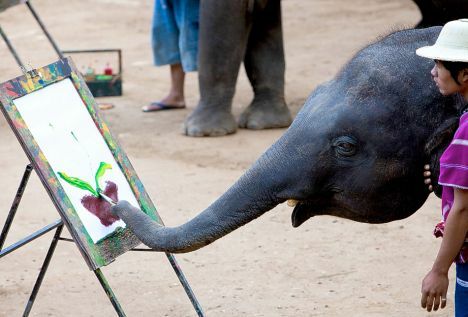 Brittany, an elephant from Milwaukee, can often be found splodging shapes on a canvas with her trunk, before waving it around and asking for more paint to decorate her picture with. Her trainer Danielle Faucett claims that she can tell that Brittany really enjoys her work, using them to earn her keep and selling them in the Zoo’s gift shop. Painting elephant’s have been involved in much controversy as in Elephant Institutions and Sanctuaries many seem blessed with amazing artistic talents, as they paint pictorial images that are easily recognisable as flowers and elephants. But it’s all a little bit of a trick, as the companions that stand beside them tug at their ears in particular ways to guide the paintbrushes – sneaky eh. However, Brittany’s work is entirely her own and she’s said to flap her ears in delight as she paints away with her trunk. Congo was once offered a pencil and piece of paper from zoologist and artist, Desmond Norris and the rest, as they say, is history. Congo took to painting almost straight away and is described as having a pretty abstract style, not that we’d expect it to be anything else. However it’s been stated that Congo clearly takes in the canvas he’s creating as he knows when it’s finally finished – screaming if it’s taken away too early and refusing to paint when he believes it’s finished. 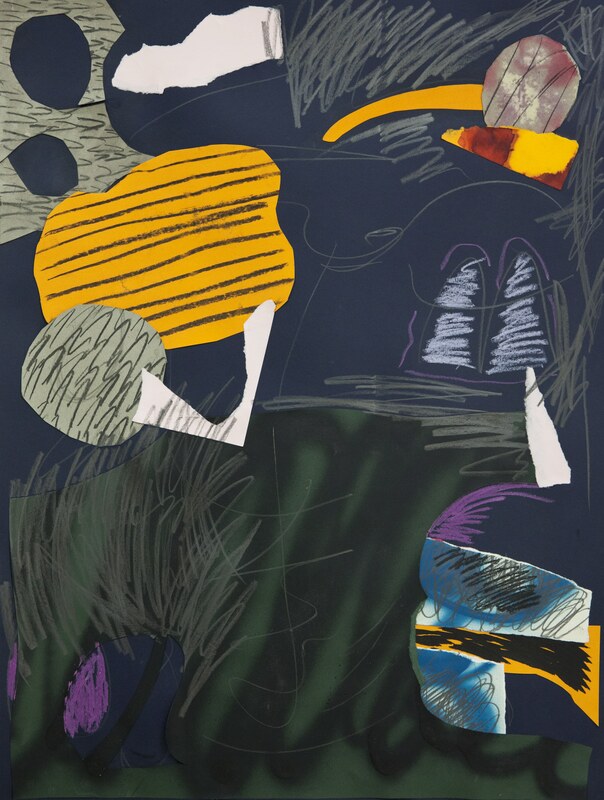 And he’s enjoyed a pretty successful career with three of his paintings being sold for over £14,000 at auction, while in the same sale work from world-renowned Warhol and Renoir had to be withdrawn there was so little interest. Congo has also enjoyed time as a TV celebrity, being the star of Zootime. Whilst enjoying a 5-year painting career, Koopa created up to 827 pieces of artwork and now his paintings hang all over the world. He’s got a pretty unique painting technique and slides on his belly or walks across a paint-splattered canvas, creating a piece that is full of natural swirls, a bit like a giant painty water-slide. 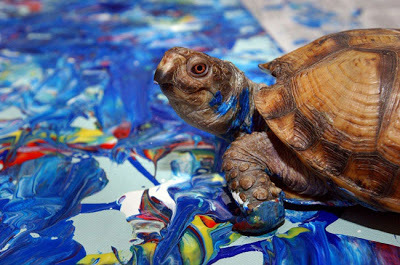 Kira Varszegi, his owner and also an artist, sells the work created by the turtles belly and donates 20% of the profit to turtle rescue organizations and Koopa has managed to raise over $10,000 – pretty impressive seeing as he can’t even hold a paint brush. 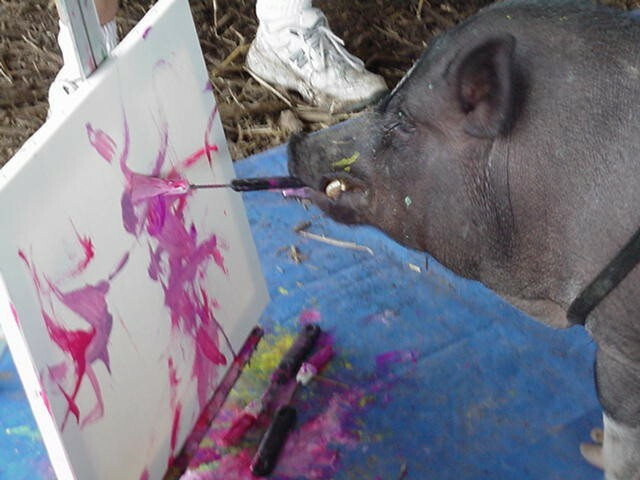 This painting pig states ‘in his own words’ that: “I never imagined that my love would eventually become my profession and I’m so grateful that it happened that way.” And even though he “never attended Art College” you can still buy one of his masterpieces, or commission your own unique work. Smithfield makes the most of his talent and enjoys the spotlight making appearances at birthday parties and on TV, even enjoying “15 seconds of fame on Oprah”. He also tried his luck on America’s Got Talent, but never made it through – some people just can’t appreciate art when they see it… As well as painting in front of huge crowds Smithfield has got a couple of other tricks up his sleeve, including giving you a kiss in a kissing booth – lovely – and he can even play the piano. Cholla, a horse from Nevada, has had his work compared to Pollock, as like all our other animal artists he’s work is distinctively abstract. His career was kicked off when he was entered in an exhibition, as it was stated that ‘anyone’ could take part, the judges had to yield and in the end awarded him with an Honour Mention of the Jury. 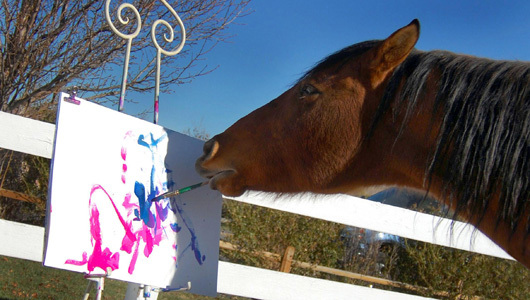 For a semi-wild horse his work could be seen as fairly remarkable, as he’s able to handle the paint and paintbrush, clutching it in his mouth, in a rather calm manner, picking and changing the colours as he wishes. Since his exhibition début Cholla has had his work displayed many times, with it even travelling out of the US to Venice and Rome. Mary Stadelbacher of Shore Service Dogs trains assistance dogs, but also teaches them the art of painting and one pup displayed particular artistic flair. Sammy showed an extra sprinkling of artistic talent when he was first handed a paint brush and now sells his work for a lot more than dog biscuits, with all the profit going back into the Shore Service organisation. 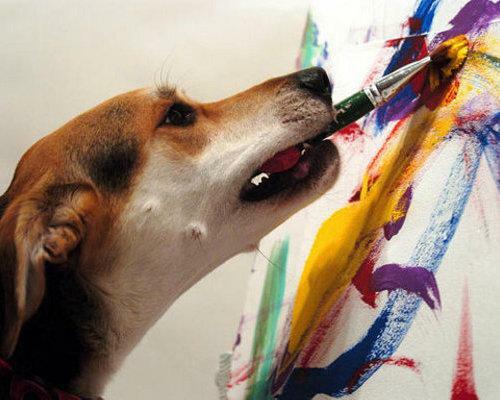 Sammy is also a fully trained service dog and with his specially designed paintbrush he creates abstract and modern pieces, obviously, and can sell one piece of work for up to $1,700. He even makes the piece extra special, signing it with his own paw print. Woodland Park Zoo held the first non-human art show in Seattle, called A New Breed of Art: Creations by Woodland Park Zoo, in which they displayed a range of artwork from the Zoo’s inhabitants. With roughly 20 pieces of art on show and some animal footprints thrown into the mix, it acted as a fundraiser for the Park. The keepers had first introduced painting as a way to keep the animals physically and mentally stimulated, but some showed more artistic flair than others and the stars of the show were Towan a talented orang-utan and Watoto an elephant artist – Zoo Art Kings I think the rest of the animals refer to them as.